WASHINGTON - President George W. Bush, disappointed at the Democrats' seizure of the House of Representatives, will hold a news conference on Wednesday to urge his opponents to work with him, the White House said. The news conference was set for 1 p.m. EST (1800 GMT). White House spokesman Tony Snow said the outcome of the elections, in which Democrats were projected to win control of the House and pick up several Senate seats, was "not what we would've hoped." "But it also gets us to a point: Democrats have spent a lot of time complaining about what the president has done. This is an opportunity for them to kind of stand up," Snow said. Bush, whose Iraq policy was a key factor in the elections, had dinner with top aides and close friends Brad Freeman and Don Evans, the former commerce secretary, and watched the election returns on television in the White House residence. He was told formally by his top political adviser, Karl Rove, that the House had gone to the Democrats. It was described as a businesslike environment with aides thumbing messages into their blackberries to keep track of developments. 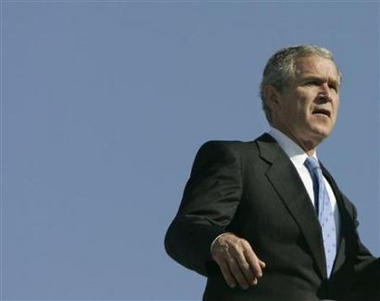 The bad news came after Bush spent the last five days of the campaign trying to help Republican candidates in 10 states. "Now, one of the things is both parties have got a lot work to do," Snow said. "The president has got a very active agenda for the next two years and you're going to need both parties. There has to be a calculated decision by the Democrats."